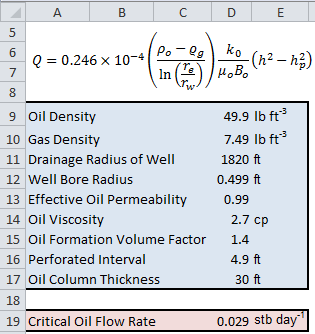 This Excel spreadsheet uses the Mayer and Garder correlation to calculate the oil flowrate necessary to form a stable gas cone in an oil and gas reservoir. Gas coning references the tendency of gas to flow in the direction in which its face the least resistance, against the flow of gravity. Above the critical oil flowrate, the cone will breakthrough and gas will force the oil flow downwards towards the well perforation. At this point, gas will tend to dominate crude oil production (often to the point where the well is not economically feasibile). Gas coning is often significant if an oil reservoir is in contact with an aquifer or gas cap. The Mayer and Garder equation and a screengrab of the spreadsheet are given below.